Adrianne asks you to deliver a sword to Proventus Avenicci, her father. Adrianne Avenicci is a blacksmith who owns the smithy and weapons shop, Warmaiden's, in Whiterun. When asked if she works her forge all day, Adrianne will admit that she does, and that she recently forged a greatsword for Jarl Balgruuf the Greater in an attempt to impress him. However, she can't seem to find an opportunity to deliver it. 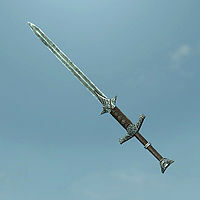 She would like for the sword to be delivered to her father, Proventus Avenicci, the steward of Dragonsreach in Whiterun. Proventus is generally found in the main chamber of Dragonsreach, beside the throne. Deliver the sword to him, telling him that it is from his daughter. He will remark, "From Adrianne? Ah, this must be that weapon for the Jarl. Poor girl, so eager to prove herself. I'll present it to Balgruuf when his mood is... agreeable." He will then reward you with twenty gold. If you sided with the Stormcloaks in the Civil War and have completed Battle for Whiterun, Proventus will be in the Blue Palace's basement along with Balgruuf and Irileth. The quest is otherwise the same as if you had joined the Imperials. As a quest item, the sword has zero weight. It can be tempered, but not enchanted, making it a potentially useful item to hold onto early in the game. Weapon Plaque and Weapon Rack objects will take quest item weapons from the player. If you place Balgruuf's Greatsword on a weapon rack or plaque, the quest can still be completed by talking to Proventus, the sword will disappear from the rack/plaque, and then the slot the sword occupied can never be used again. This bug is fixed by version 1.1 of the Unofficial Skyrim Patch. The following empty quest stages were omitted from the table: 0, 255, 300. On the PC, it is possible to use the console to advance through the quest by entering setstage FreeformWhiterunQuest03 stage, where stage is the number of the stage you wish to complete. It is not possible to un-complete (i.e. go back) quest stages, but it is possible to clear all stages of the quest using resetquest FreeformWhiterunQuest03. This page was last modified on 3 May 2018, at 23:15.